Current events are reminding me of that version of Happy Birthday that Kyle and Becky taught us in college, hence the title of this letter. I found out this morning that Meredith died. She didn't want to live after Don's death - I can fully understand that! - and she died over the weekend. I had a good talk with Craig this afternoon; he seems to be doing okay. It wasn't a surprise, but he's lost both parents in less that a year, and it's hard. There seems to be so much bereavement around me right now. Maybe I'm just more sensitive to it. Remember when we were looking at used cars? We'd never noticed used car places before, but after that it seemed like they were everywhere. We giggled a lot about that. I'll miss seeing Meredith at the post office. I've had a busy day. I washed windows, took the screens out and hosed them down, got three out of four flower beds weeded, and mowed. I still have pruning and cutting back to do. But it's presentable. And the hard-black-rubber-thingie that the grass comes out through finally fell off. It was hanging by one bolt for years. I need to go to the John Deere place and get a new one. I looked like I'd taken a shower in grass clippings today. Now I know what those things are for! I found this today and immediately thought about you. I remember your riddle back in college: There are three scientists in the room; how do you tell which is the chemist, which the zoologist, and which the dermatologist? It's easy - you ask them what a mole is. This was definitely done by a chemist who is married to a zoologist. There's not a dermatologist in sight. I do love your sense of humor! I love the way you play with language and love your enjoyment of irony. We both always loved humor of the mind - we could imaging few things worse than watching Animal House or Three Stooges reruns. Humor based on dumb behavior had no appeal for either of us. We're well-suited to each other. Or, as we often put it, it's a good thing we married each other instead of inflicting ourselves on other people. However you put it, I'm so glad I married you! I still struggle to believe I made such a good choice when I was so young. But I suppose some things are just obvious. 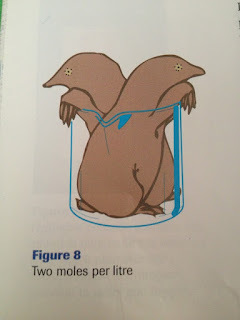 I love you many, many, MANY moles per liter!